So many lessons to learn—Guinea pig camps are intense. In the morning, one of the little ones was almost unconscious. At first, I thought he was dead. Guinea pigs are fragile and when they get sick, usually, it goes quickly downhill and there’s not much we can do about it. I notified everybody that he would probably die so no one would be shocked by it, and proceeded to give him emergency care: warmth, orange juice and rest. I also gave him a few “flakes” of cucumber and carrot, and he ate them, which was a good sign. Danielle, of the team where he belonged, monitored his progress closely. Surprisingly enough, he improved rapidly, and, at noon, he seemed to have recovered. At 2 pm, he was working, going the full course of obstacles and learning the indication behavior “paw on cube” he will need to point out the target scent when we get to that step today. I dubbed him ลูกปุย (Lūk puy). I have this habit of naming the Guinea pigs in Thai. His name means “fluffy baby” or “fluffy ball.” ปุย is a common nickname for Thai girls, but I don’t think he cares too much about that. Here is ลูกปุย showing his newly acquired “paw on cube” skill. Less than perfect is… perfect, seemed to be a lesson to learn from Michael’s team. His teammates are rookies, but dedicated and positive, and Michael is an excellent team leader. Everybody commits mistakes and, naturally, rookies error more often than experienced trainers. In order to progress, we must evaluate our POA (plan of action), analyze our mistakes and correct them—but that’s it, no more, period. Alas, I see many trainers getting too upset when things don’t go the way they want, which ends up working against their best intentions. Not so in Michael’s team, they took it cool and at the end of the day both their piggies were running the whole course and showing the indication behavior they should just perfectly. To bring it all into perspective (see my blogs from yesterday and the day before), a little emotion and stress are necessary to learn and to achieve success—and too much defeats the purpose. It’s all a question of balance. 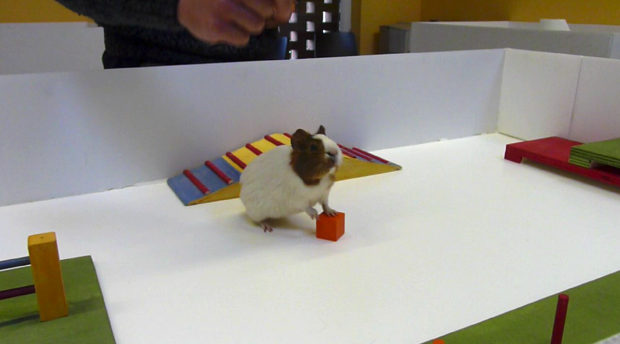 Amazing, isn’t it, what little creatures like the Guinea pigs can help us realize? Then again, there are lessons to learn everywhere if we care to watch and to listen. The difficult part in doing it, is that we have to, if only for a moment, forget ourselves, be aware that we are not the center of the universe even though it may appear to be so for us. Not easy, but doable and extremely gratifying, if you ask me. Featured image: Guinea pig showing target indication (photo by Manuel Castaneda). Learn more in our course Ethology and Behaviorism. 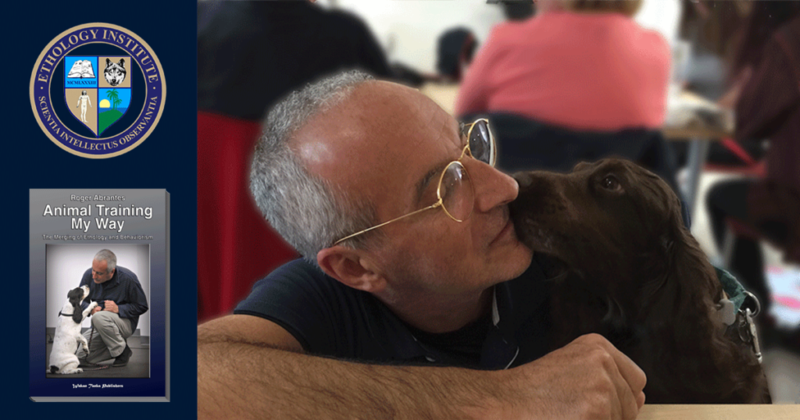 Based on Roger Abrantes’ book “Animal Training My Way—The Merging of Ethology and Behaviorism,” this online course explains and teaches you how to create a stable and balanced relationship with any animal. It analyses the way we interact with our animals, combines the best of ethology and behaviorism and comes up with an innovative, yet simple and efficient approach to animal training. A state-of-the-art online course in four lessons including videos, a beautiful flip-pages book, and quizzes.